Dahlias, native to Mexico and Central America, are prized for their large flowers. Available in every color but blue and black, they bloom late summer and into autumn when other flowers have begun to fade. 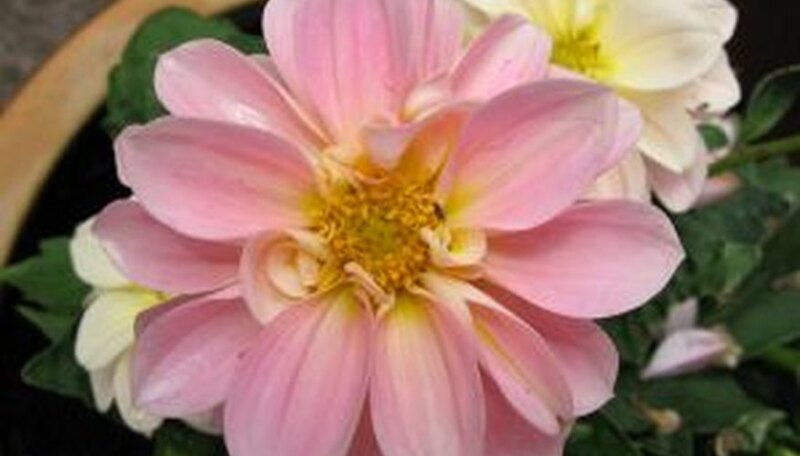 Dahlias are not frost hardy, so those grown outdoors must be dug and brought in to overwinter. Growing dahlias in containers saves some of this work as you can grow them indoors, or bring the containers in before the weather turns. Choose dwarf varieties for indoor planting instead of the large giant varieties. Choose well-draining pots that are at least 12 inches around and 12 inches deep. Place clay shards over the drainage holes to keep the soil from running out with the water. Fill the pot with 1 part potting soil and 1 part compost. Add one handful of bone meal to the potting mixture in each pot. Plant the tuber in the center of the pot 6 inches beneath the soil surface. Place it so the the eyes on the tuber face upwards. Water just enough to dampen the soil but not enough to make it heavily wet. Once sprouts appear, water 2 to 3 times weekly to keep the soil moist. Fertilize every two weeks with a low nitrogen liquid fertilizer. Apply fertilizer from June through September. Place the pots where they will receive 8 hours of bright sunshine daily, such as a south-facing window. Move outdoors if possible to ensure best growth. Allow the soil to dry out by mid-November. Store in a 40 degree Fahrenheit dark room until spring. Stake the flower stem to help support the blooms. Cut blooms often for bouquets and arrangements. This encourages further flower production. Spider mites are the main concern with indoor dahlias. Treat infections immediately.